or anodic/cathodic character. This is where scanning probe electrochemistry is ideal. 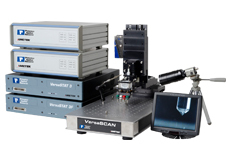 Each VersaSCAN system consists of a high resolution, long-travel, closed-loop positioning system mounted to a vibration-resistant optical base. Auxiliary pieces are then added, each with its own functionality for specific scanning probe experiments. These ancillary pieces include electrometers, piezo vibration units and laser sensors. Finally, Ametek VersaSTAT potentiostats and Signal Recovery Lock-in Amplifiers are integrated via ethernet control, to measure small signals accurately. Each technique uses a different measurement probe that is positioned close to, but not in contact with the sample. After measurement, its position is incremented. A data map is created by plotting the recorded parameter against the probe position. Depending on the technique, this map represents local electrochemical current, impedance, relative work function or topography. New system with soft probe technology, overcoming key limitations of traditional SECM. 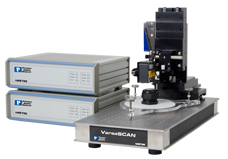 The VersaSCAN SECM integrates the base with two VersaSTAT potentiostats and an ultramicroelectrode probe with a specific tapered polish. SECM is a versatile technique, adding spatial resolution to applications such as kinetics, biological sensors, catalyst and corrosion mechanisms. 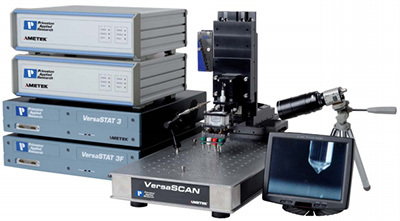 The VersaSCAN SVET electrochemical scanning system integrates the base with a Signal Recovery Lock-in Amplifier, piezo-based vibration module, electrometer and a single wire-based probe. SVET measures voltage-drop in solution. This voltage-drop occurs in the electrolyte because of local current activity on a sample surface. Applications include non-uniform corrosion events, such as pits, welds and galvanic couples, as well as biological applications. 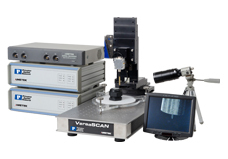 The VersaSCAN LEIS consists of the base with a VersaSTAT 3F equipped with differential auxiliary option, electrometer and dual-element probe. 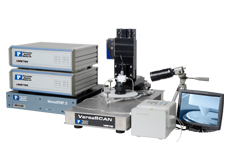 LEIS electrochemical scanning is a technique for calculating local impedance, by determining the ratio of AC voltage applied to the sample, and local AC current measured by the probe in solution. Applications include organic coatings and bare metal corrosion. 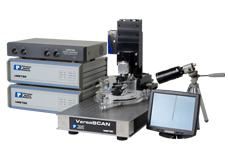 The VersaSCAN SKP includes the base with a Signal Recovery Lock-in Amplifier, piezo-based vibration module, electrometer and a tungsten-wire probe. SKP measures relative work function difference, between the measurement probe and the position on the sample. It is a non-destructive technique typically used in ambient or humidified air, without an electrolyte. Relative Work Function can be correlated to Corrosion Potential (Ecorr). SKP can be used for applications including materials, semi-conductors and corrosion of metals – even with coatings. 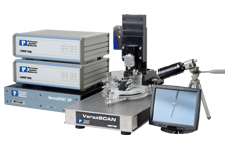 The VersaSCAN SDC consists of the base with a VersaSTAT, PTFE machined head and a peristaltic pump. SDC electrochemical scanning confines the electrochemical measurement to the small droplet of electrolyte, defining the area of the electrode/electrolyte interface. Applications include kinetics, corrosion, fluid-flow studies and applications where a small area on a sample needs to be investigated, without cutting the sample or subjecting areas to different electrolyte exposure times. Constant bias/swept position plots for data maps and fixed-position/ dynamic signal plots for Cyclic Voltammetry, Tafel, EIS, etc. The VersaSCAN OSP includes the base with a high accuracy, fast laser displacement sensor. OSP electrochemical scanning employs a diffuse reflection mechanism to measure the sample’s topography. 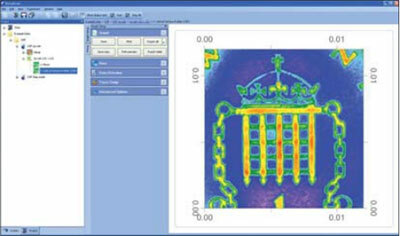 OSP can also be used as a very sensitive levelling mechanism or to chart topography for implementation with other scanning probe techniques for constant-distance operation.